Lesson of Confession–"I'm Drowning. Help." Life has many irrefutable truths. One? We get out of life what we put into it. We will get out of our writing what we invest. We cannot expect large returns from a social media platform if we rely on robots (automation) and connect randomly and half-heartedly. Social media is about relationships and being fair-weather friends has limited effectiveness. Sure, there are flukes, people who run face-first into blind luck. But, one thing I’ve learned is the harder (and smarter) I work, the “luckier” I get ;). When we take hold of a dream, we are assigned a sort of spiritual plot of land. Depending on the dream will depend on the plot. If we want to grow fresh peaches for our family, we don’t need a thousand acres. But, if we wish to make a living as a peach grower? We’ll have much more land and work ahead. Same with writing. If our goal is to publish a memoir to hand down to our children, this is a different “plot” than if we desire to be a NY Times best-selling authors. Some land is more fertile than others. If we grew up as children of famous authors, surrounded by other successful writers, then we have a reasonable head start. We “inherited” a grove and aren’t starting from scratch. Most of us are not so fortunate, so we need to start preparing our “land” early. This is when we get our land and realize there are a ton of weeds, crappy soil and a zillion dead trees and trunks that need to be removed. There might even be some junk cars, scrap metal and old toilets that need to be hauled away. We need to form new habits. We need education, training and practice. We need to learn about branding and start building our platform. When I left paper sales and decided to become a writer, I needed to learn the craft. I had bad habits. I put myself last on the list because writing wasn’t a “real job.” The early years is a lot of clearing away insecurity, fear, and even laziness. We learn to write even when we don’t “feel” like it and come to understand that simply showing up is a bigger deal than most people realize. Blogging trains us to keep a professional pace. It trains us to show up and not be too dependent on others. Sure, it’s fun blogging now that I get 95 comments, but there were years I blogged to the ether. I didn’t do it for others. I did it for ME, to train me. Blogging is also the most resilient form of social media and one of the best investments of time when it comes to ROI (return on investment). No search engine will direct people to your witty tweet or clever Facebook post. Search engines WILL, however, start sending readers to your blog (if done properly). Also blogs can be harvested for books and promotion (and if you want to know how, my new book gives a step-by-step plan). Sowing also involves research, plotting, writing, finishing then revising the book. After we’ve planted a lot of good stuff, it’s easy to get discouraged. We don’t plant a peach pit and a week later have a ten-foot-tall tree raining yummy peaches all over the ground. In fact, for a loooooong time, it will look like nothing is happening. It’s because that peach pit is germinating and putting down deep roots before much appears above the surface where we can see results. We need deep roots to make it in this business, because high-winds and storms don’t stop because we want to write books (as I talked about in yesterday’s post). Did you know that the root system of any tree needs to be as wide if not wider than the span of the branches? What is below (unseen) must match (or even outmatch) what is above, or the tree will fall over and die with the first bad storm. The Silent Years can be brutal and this is why most writers don’t make it. This is when we suffer a lot of angst. When people ask us what we do and we say we’re writers, we get replies like, “No, I meant what is your real job” or “Really? Where can I buy your book?” We must learn to brush off any insecurity and criticism and simply appreciate we’re growing, preparing for greater things ahead. This is tough in a world addicted to instant gratification and an over-reliance on luck. Too many people want fruits with no roots (thanks, Joyce Meyer). If we keep pressing and don’t dig up our seeds to check if they really are growing (which is highly tempting), eventually we can reap what we’ve sown. Ah, but here is the catch. Back to my peach example. After a long wait and tender, patient care, we get a tree. YAY! Eventually, we see little tiny fruits popping out. AWESOME. The smart grower plucks off all the tiny green peaches. OH NO! Why? So the tree will bear more fruit and better fruit. For us? This could mean writing two or three bad books before we get a winner. It could mean multiple revisions. But, to gain more, we have to sacrifice. In the beginning, we have a lot of back-breaking work. But, if we are patient and consistent we can finally reach a maintenance phase. Once the grove of peach trees is producing, we keep fertilizing, tending, and harvesting. An author platform is the same. In the beginning, we need to build traction. Yet, there will come a time when we can back off. We need to let the soil rest. We need to cycle in other crops. We need margin in life or we lose that creativity and passion that started us on our path to begin with. One writer wants everything instantly. This writer wants a thriving platform and big books sales too early, and maybe resorts to shortcuts. They spray chemicals on green immature peaches (blogs/books) and try to pass off bitter, tasteless content to consumers. Or they just jump into the market too soon. The other writer overworks the grove and production eventually suffers. I’ve been guilty of both mistakes. When I wrote my first social media book, I failed to build a platform ahead of time. My first royalty check was dismal and made me cry for three days. I needed to dig in and keep cultivating. Now? I need more margin. I’m cutting this blog back to two days a week. I’d rather give you guys two fabulous blogs and more books, classes, WANACons and consulting. Right now, I’m blogging because I love it. It’s fun. But there are better ways I can serve you and help you learn and grow. We can get so in a habit of doing something, we fail to see when we can (and need to) stop overworking. And this is a tricky blog to write, because I want to tell you there are times for the back-breaking-put-all-you-have-into-it-work. There are no shortcuts and this isn’t offering excuses. The marketplace is glutted with books and without a platform, our odds of success are better with scratch-off tickets. But I also want to impart on you, that there is also a time to back away. We need balance to maintain. I will still be working my tail off, just in different areas ;). So what about you guys? Are you guilty of living too much with your accelerator pressed to the floorboard? Do you struggle with knowing where and what to let go of? Do you put everyone and everything ahead of yourself and your writing and it’s making your “creative field” suffer? To prove it and show my love, for the month of November, everyone who leaves a comment I will put your name in a hat. If you comment and link back to my blog on your blog, you get your name in the hat twice. What do you win? The unvarnished truth from yours truly. I will pick a winner once a month and it will be a critique of the first 20 pages of your novel, or your query letter, or your synopsis (5 pages or less). I will announce October’s winner next week. I’m offering my First Five Pages Class November 14th 8-9:30. The first five pages of any novel are the most critical and I will teach you how to hook hard and early and also how to spot bigger problems in your novel. I’m also offering my Antagonist Class. The antagonist is the beating heart of the story. If you can’t seem to finish a book or a book isn’t selling or is getting rejected, this class can help tremendously. There are also upgrades where I work with you one-on-one to repair or even create your plot. Love reading your blog but I’m glad for YOU that you aren’t going to post every day. There’s no need to keep up that pace (unless you’re inspired to post more often). I think that everyone has to set their own limits, even if, for someone still in the Silent Years phase, it adds on a few more years still. There’s nothing to be gained by going forward so full-tilt, you end up burning out. I had that experience with the first novel I wrote, and it wasn’t even a good novel at that, and remains incomplete (although hopefully someday I’ll figure out how to fix it). With you, I think blogging twice a week is a good decision. Your posts tend to be very comprehensive, and I like to take time to read every word. But it’s hard to do this when there are new posts coming every day;like most people, I only have so much time. So twice a week might actually be a better schedule for your readers too! It’s never been clear to me why anyone expects their success as a writer — esp. someone new to the business (and it IS a business you need to learn and understand) — to be quick or easy. Seriously? Because….? I’ve been writing for a living — groceries, rent, tuition, books — since my sophomore year of college and that was 30+ years ago. One of my toughest magazine editors ever (yes, I cried once) is still a Facebook friend and was happy to promote my own webinars last week…decades after we first met when she edited the hell out of my work. This week I’m coaching writers in Australia, NZ, Chicago and Connecticut — but I’m also being helped and mentored by writers with expertise I need from Michigan, Pennsylvania and Brooklyn. There is absolutely no way any writer with serious ambition is going to “make it” without a long time planting seeds (generosity, wisdom, advice, thumbs up) and trusting they will grow into a fruitful, giving orchard. They will. But some will die on the vine, as some people take advantage of you. Move on. Get tougher and more selective. This weekend I’m loading our car with post-op surgical equipment to lend to an editor I worked for freelance about 15 years ago who now needs the same hip replacement I had in 2012. We are not close friends and have never socialized. She can’t even give me any paid work. But we are part of the same tribe. Until you get that, you are not going to make it in any meaningful way. I really enjoyed your tree analogy. That one is really going to stick with me! I’m glad you’re looking for some balance with your blog, though I’ll miss your daily posts. I’ve said before, I’m an intern architect. This means I need a number of hours in different parts of the profession. I consider myself an Intern writer too. I need to spend time in different parts of the profession here as well, to perfect my craft. It will take longer as I am choosing 2 careers, but I believe it will be worth it in the end. Also, love the gardening metaphor here. Are you sure you weren’t a preacher in a past life? What a fantastic and uplifting sermon. LOL. I actually did consider ministry. And I suppose I sort of have one. I can help writers, create community, teach and give them the grow-up stuff. I never blog on flooty-tooty hanging out with the muse stuff. I try to tell how it is and what to do and what to expect. Using my evangelical abilities to keep writers encouraged :D.
Outstanding post! I’m a writer who also grows peaches. Then I am glad I didn’t butcher the analogy, LOL. What a peach of a blog post! I agree; to post constant commentary out to the ether is the pits, but I’m hoping to see the increase you’re talking about some day. I will miss the guaranteed laugh, smile and pensiveness inspired by your daily posts, but I understand your need to prioritize things. When you said showing up was more important than people realize, I nodded and thought, “This is why NaNoWriMo is a good thing for writers.” I’m former military, raised by a perfectionist, so if I make a schedule, I stick to it. I was showing up and writing my series three to five hours every Monday through Friday. I had word count goals. However, I’m uber-competitive (you caught I was raised by a Type A perfectionist, right?) so the idea of a competition to write 50,000 words lights an additional fire under me. My novel really needs to be between 60 and 70,000 words, and that total is my real goal. Further, I want it done before Thanksgiving because I’m having a house full of family and I will need to recover the day after and then – BOOM – November 30th. I hope you will offer your First Five Pages class after November is over because I feel like my beginnings are seriously weak, but I’m not planning any classes this month because I will write the second book in my series in November (or die trying). Kristen this is one of your best blogs. Beautiful to look at. Great metaphor & fun to read. But most important, absolutely true. I’ll miss the daily blog but look forward to the new format. Great post. I hope to harvest some day. Hi Kristen! My creative “field” is definitely suffering. Hubby is still very sick and I’ve had to take up the slack at home and at work. He’s on permanent disability and I’ve become the sole bread winner. I’ve flitted through two jobs on my way to the one I’m in now…a real career I truly enjoy. I’m the administrative assistant at my sister’s church and I love the people and the work, but so far I’ve had little time to write. I’ve been here for three weeks, though, and the workgetting easier as I learn the ins and outs of the office. I’m even finding time right now to go on line and visit YOU, my favorite blogger! yay. Super post! I’m half tempted to cut back to two posts myself and then ramp it up again in different writing seasons like Poem a day month. It’s so easy to get too used to something and think bleh! it’s just the same. I like growth and spontaneity even if google doesn’t. I’ve been mainly guilty of two things. One I have conquered. The other is still a struggle. The first was, refusing to read a book on the craft. I already knew how to write. I was good at it. Why would I need to read a book on the craft? I really had no idea how much I didn’t know. I now estimate that I could have saved myself a couple of years of editing time had I just bothered to learn more about the craft. Once I picked up a craft book, though, I became addicted and spent the next few years studying the craft. Problem solved, I just wish I would started learning more about the craft before I wasted so much time editing, when I didn’t know what I doing. The area that I still struggle with is putting my writing last. Especially, when I am working on an editing project for someone else for pay. I feel like they are paying me so I should put them first. Fortunately, I have found a new beta reader to read my WIP and she is expecting pages from me this month, which I think will be my last edit. I guess that’s were building a tribe really helps me. If there are people expecting things from me, I will do them. It shouldn’t be, but it’s harder to make myself live up to my expectations if people don’t know about them! Your insight crosses over to so many other aspects of life. In fact, I shared this with my Facebook followers who’ve adopted and have children who suffer from attachment issues. It takes work, there isn’t an immediate visual change, but we keep loving because they need it. As for the writing aspect, really something I needed to hear! I’ve been discouraged, not enough comments on my blog, not enough followers on FB, it can get me down, but I know I’m doing what I’m meant to, so I press on, and I press on because I LOVE what I do! I also have other life issues that take my time, my son who has Autism, and my daughter. There are times when I have to put my blog aside and make sure I’m doing everything I can for them. Your encouragement is appreciated! Thank you. So many good points! I’ve been blogging for a while, but most of the time I haven’t released anything to the world (just private password protected links for close friends and family.) Now that I am opening myself up I love reading posts like yours that help with the guidance (and perseverance) portion of blogging. Thank you! I really needed this writer’s medicine today- thank you for the reminder that everything needs time to grow, even our creative babies and it isn’t always smooth sailing-I am going to keep tending, weeding, and feeding. Reblogged this on Write the Vision. Thanks, as always, Kristen. I found a lot of validation and hope in this post! Definitely a post that bears reblogging. If you don’t follow Kristen’s blog (you should) here is a super inspiring post for writers on sowing what we reap. For me, I WANT to do too much, and tend to overschedule. Then “life” gets in the way. That life is in the form of 6 adult children and 8 grandchildren who take up a lot of my weekend writing time. And since it’s not a “real job”, nobody understands the driving NEED I have to continue on with my various writing projects! Thankfully, my husband is understanding, and I tell him I need to start looking at it as a college class… a NEED to schedule time – no matter what! That’s a great analogy you made regarding you reap what you sow. If you want daffodils in your garden in the spring then you’d better start planting them in the fall. Writings no different. Drafts take time. And sometimes ideas have to sit and settle for awhile before you can discover what you’re really writing about. A seed looks nothing like its fruit. I really got a lot out of your book Rise of The Machines Human Authors in a Digital World. As someone new to this world of digital publishing you really made me aware of its workings. Thanks for writing it. I think you wrote this for me… Thank you. I was nodding throughout. Wonderful insight! I know that when I first started, I thought, “I know how to write.” And a little ways in, I realized, “I don’t know how to write.” I was a good writer, but I didn’t have all the craft knowledge, skills, and wherewithal I needed. I had to work the soil and tend my crops better, so that I can reap a long, good harvest. I also believe it’s very important to have an online presence, but finding the right balance and how to be present yet productive is an ongoing challenge. Blessings to you! Patience isn’t my overriding virtue… But I’m trying! It’s better to be in the Silent Years than it was before, when I wasn’t writing, wasn’t cultivating anything and hadn’t heard of you!!!! I can’t imagine that now, since I try and implement as much advice from you as possible. This is wonderful Kristin, thank you for taking the time to share your clear-eyed perceptions during a tough time. I can’t believe you blogged into the ether for a long time. We all have to rebalance at different times of life, and I love the farming allegory. I’m glad so many people are reblogging this! I’ve been blogging for years and it’s only recently that I’ve wanted readers and, more importantly, readers who comment. It, too, blog because I enjoy it. It’s also built a discipline of posting on a regular basis that was important to me. Kristen, as usual, you keep giving us the goodness. 🙂 The post below mentioned you today. Kristen, this amazing analogy was not only inspired, but inspiring! Just what I needed to hear today. My past twelve months have been remarkably similar to what you described in yesterday’s blog, only spread out over the year and not all at once like yours! So I feel your pain. And your aunt’s, too, in spades. Please tell her I have added her to my nightly prayers and am sending her healing thoughts. You’ve been added to the list, too. Over this past year I did manage to revise my first book and send it out, and am now working on the next two plus developing a blog and website. Oh, plus reading your blog and social media books. Thank you, thank you for the steady doses of inspiration! Hugs to you and your family. I really identified with this post, thanks for sharing it. And the lovely pic of fuzzy peaches. Exactly the kind of advice I needed to hear right now. I’m glad this post coincided with my first year of gardening because I SO get this– I was a very bitter girl when I had to weed out half of the spinach I had planted from seed (WHY!) so that it would produce a healthy crop. I am definitely in the “sowing” stage right now and trying to keep my head down while I develop the stamina (thank you blogging) that is necessary to become successful. Glad I found your blog, this is some good stuff. How long are the silent years usually? I thoroughly enjoyed your article. As a person who loves to write and is not really sure what to do with that.. try to make some kind of career of it, just keep it as my hobby, attempt to write a book, or whatever… I appreciate the insight and words of encourageent. Thank you for sharing! No matter how many of your blogs I read, Kristen, I still learn from each one.I, too, wrote and published my first book before “clearing the land” and building a platform. But since then, mostly thanks to you and your books, I have cleared, sowed and cultivated, a well-growing platform and though still in those ‘silent years’, I am starting to reap some rewards. The Silent Years… What a telling phrase. I guess that’s when you find out how much grit and fibre you really have in you. I’m a little scared I’ll turn out to be about as gritty and fibrous as, oh, say, a blancmange…. Kristen, this is so true. I struggled for years to make myself put my writing first. It was too easy when other people in my life were treating it like some ‘funny little hobby Leisl had and one day she’s bound to come to her senses and give up on that impossible dream’, to treat it seriously myself. When you hear something so often, or feel the thought from others so often, it’s easy to believe it, but I prioritised and did reap what I sowed – I have a book published with Penguin Australia’s new digital imprint, Destiny Romance plus a new contract for the first in a paranormal series with them. Now I’m reading your book and your blog and trying very hard to grow my platform (something I wish I’d started much earlier, but at least I’d started some of it a good eight months before my book came out). I’m learning all the time and sowing more and know that it will be a while before I get much of a crop. But I know it will happen because I set time every day to work on it. Prioritising is still something I’m working on. I know no social media platform building will mean a damn if I don’t have another book coming. It is always a juggle though with family and work and the volunteering I do for RWAustralia. But I’m trying to do it in a way that’s not going to drive me crazy. I know I’m not always going to find that balance, but that I am working on too. Thanks so much for your fabulous blogs. I’ll be looking forward to reading whatever you have to say whenever you have to say it, and good on you to step back and reprioritise – as you say, that can be the hardest thing of all to do. Balls to the wall writing…. yep. That’s me. Until I run off the cliff. Right now I’m under deadline so I have to be diligent. But once this book is done, I’m doing some serious soul searching to set up my goal list for 2014. Another wonderful post, Kristen! I loved the tree analogy (wide and deep root systems) and how you move it through the seasons. As others have commented, I needed this post today. Well, probably every day! Good luck in your new season with fewer posts/week. As the best teachers and guides, you don’t just teach, you model what you teach. Thank you! I think that I am one of those people who tend to bite off more than I can chew as well. I really needed this article today, and I’ve also got to admit that I need to read your latest book. I don’t do this very often, but I bought it today. 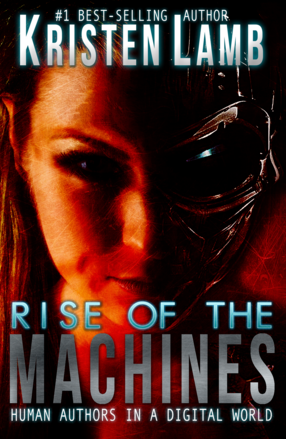 I have been looking for exactly what you have offered in Rise of the Machines. I look forward to reading it. Good for you on the decision to blog only 2 days per week. I think you’ll bring us better blogs that way and have time for writing and classes. Big Hug! Ok so if I said yes to all those questions, am I a lost cause? After the Colorado flood hit us, we were left to put out fires. It is seven weeks later and I still struggle to find time to write. I want this book done so badly. (I’m rewriting; not my favorite part.) But I know it is God’s timing not my own. That used to be an excuse now it is reality. Bottom line, I’m still in the early years clearing out the junk. No such thing as a lost cause. Nothing is wasted in God’s economy. Once everything sorts out, you will be able to channel raw emotion no other writer without that experience is capable of. Look for the treasure in the trial. I know it’s hard, but that’s the path that will take you forward. Praying y’all get back to normal and on your feet soon ((HUGS)). I so lick you’re blog. It changed my bruther’s life and bookmarking now. And also? Two months ago? I didn’t build a platform before I put my first book out. Admitting that stings less, knowing you made that rookie mistake once upon a time. Thank you for this post and I hope things are equalizing out there for you. LOVE this…great analogy. I’m in between sowing and silence right now I believe. When I was forced out ot the, “rat race,” 8-5 job I chose to write. Unwittingly, I went from commitment to condemnation. I let excuses, others and self-doubt ruin my, “creative field.” (from today’s blog). Condemnation is a serious, crippling disease for writers. I’m still limping around but because of your encouraging blog I’m looking at my writing life from a different perspective. Thanks for your inspiring words. Blogging really is a great way to train my brain. Thank you for sharing your experiences. That analogy is just peaches! And all so true. I know for certain that having an author platform and online presence helped me secure my four book deal with S&S. You never fail to give good, down-to-earth, constructive advice and particularly for those of us just starting out it’s motivating and invaluable. Thank you Kristin! Kristen, this is great advice. I’m in my first year as a published author, after a couple of decades of writing and studying the craft, submitting manuscripts and collection rejection letters. Your advice is timely to my concerns and the lovely nature-metaphors dovetail nicely in my imagination with the novel I’ve just had published. 🙂 I’ll be following! This post came at just the right time for me, my blog, and my writing goals. Thank you for the reminders (and the great plot of land analogy. I have some weeds to pull). Also, I think twice a week is the perfect amount of posts to avoid blog burnout (for readers and writers alike). Writing can be a long, hard process. And Kristen Lamb explains why. This has encouraged me. It is not for the fast and hard, it is for the slow and steady—that win the race. Deeper roots are never seen directly—but will be seen if the tree falls over because they have not grown deep enough. Thank you for the reminder. Your text is a nice analyse of how you can forget the focus. I would like to show yoy my blog. The only purpose I had is to stimulate my selfe to keep myself on my diet. It worked. And now I am looking for a new goal. Its is in Dutch, I’am afraid you cannot follow it. But I will follow you. Thanks. As always, Kristen, a very motivating and right-on-perspective post. You also had me LOL at the Spammer’s (Calvin Klein) comment. But I just try to do better and better. We’ll see how this will turn out. Thank you for writing this post. This is the type of stuff that we bloggers/writers need to hear. Thank you for displaying the beautiful tension that exists when we bring the whole of our hearts and hard work of our hands into the harvest fields of writing and blogging. It is important for us to enter this farmland with diligence and patience on our mind as well joy and a relaxed, calm soul. May we find victory and set back as welcomed part of the experience as we plant and harvest the creative thoughts, desires, and ideas within.You are a brilliant and a brightly shining farmer, giving wisdom to many! Enjoy a bliss-filled day! This was a very encourage and inspiring post to read. This is the type of stuff that we bloggers/writers need to hear. it displays the beautiful tension that exists when we bring the whole of our hearts and hard work of our hands into the harvest fields of writing and blogging. It is important for us to enter this farmland with diligence and patience on our mind as well as joy and a relaxed, calm soul. May we find victory and set backs as welcomed part of the experience as we plant and harvest the creative thoughts, desires, and ideas within. Really appreciated this post. Never thought about the “silent period” being part of the growing process. Thanks for taking time to encourage others. OKAY. Put down the WIP yesterday all mopey and blue. Might have even shed a tear. Some days writing a book is like banging my head against a wall. Let me in, dang it!!! Love your pruning metaphor. It’s hard to pluck off the extra little apples on my trees, and it’s hard to whittle down those magnificent character sketches I worked so hard on but don’t advance the plot. Off to the back forty to pull out some more rocks. Twice a week is plenty of blogging! I catch up on favorite blogs once a week, and so miss out on a lot of good stuff put out by more frequent bloggers (like you!) Best wishes with your new schedule. Nice to have found your blog, and your suggestions and recommendations are very helpful. I especially like the point, “We learn to write even when we don’t ‘feel’ like it and come to understand that simply showing up is a bigger deal than most people realize.” I have found that to be true and have created a schedule for myself that fits with my job and lifestyle. You always write good stuff, Kristen. But, this one really spoke to me. I tend to be an impatient farmer, one who wants to plant the seeds and see them grow at record speed. I’m always reminding myself that time will pay off, that the field needs constant work and love. Thanks for giving us the nutrients we need to grow. Prioritising – how do you know when enough is enough?